The 'Scratch never looked better! 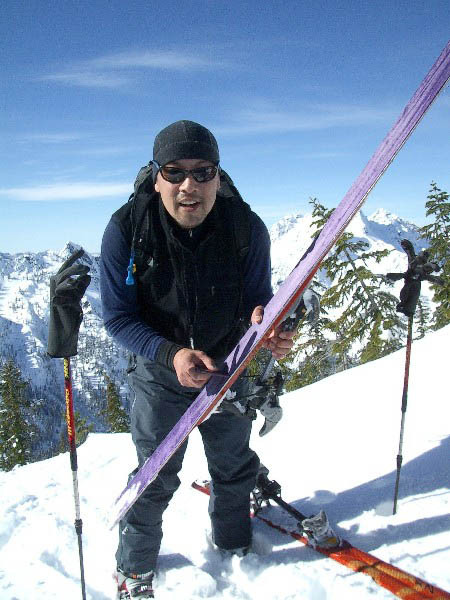 With O'Brien in Oregon moving fermented grape juice from barrel to barrel, Kevin and I decided on a recon trip up Snoqualmie Mountain to check out the north facing couloirs "Crooked" and " The Slot." 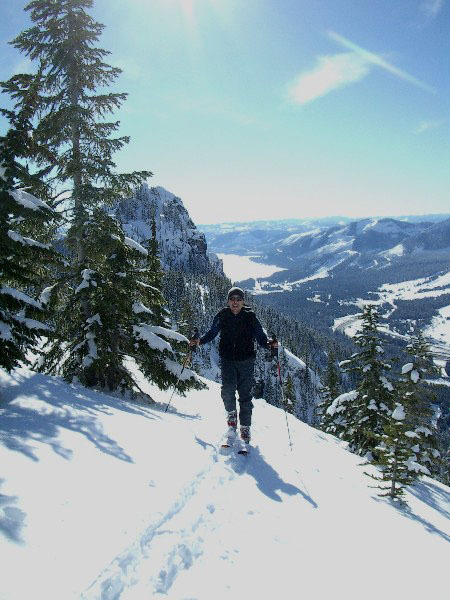 While snow conditions promised to be a little below par for the winter of '03-'04 (especially following a week of fresh tracks every day), the weather was as good as it gets, we headed up Commonwealth Basin from the north end of the Sahale property. 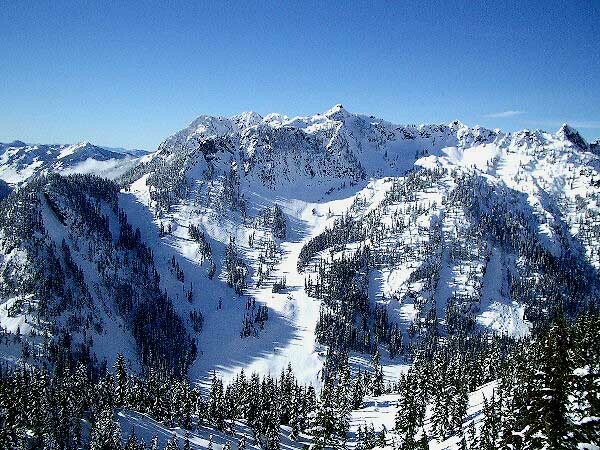 The skin up went quickly, as the track resembled a superhighway for skiers and snowshoers up and around Guye Peak. 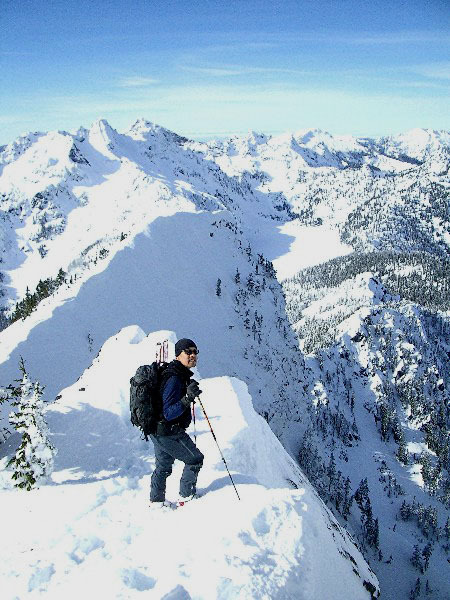 The going got a little tougher as we passed Cave Ridge and only skin tracks were left, and downright bothersome as we ascended the south ridge of Snoqualmie Mountain, where I finally booted up an icy section in exasperation. The climb to 6,200 ft. was done in around 2:35, and we traversed under the rock face at the top of the mountain, headed for the notch to the north of the summit where the Slot entrance reportedly lay. 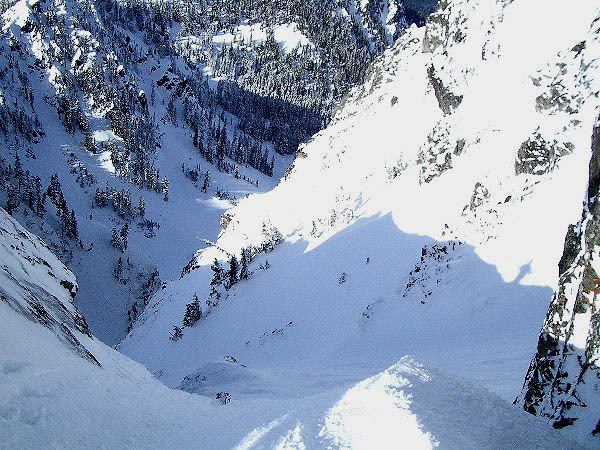 Having no firm information on what the entrance to the couloir looked like, we looked at several slots leading down the north slope of Snoqualmie Mt., two of them extremely sketchy looking lines between rock walls that fell off into obviously steep descents. After some conversation, and not wanting to end up stuck mid-descent and having to boot back up, we decided to ski the Phantom back down the front side of the mountain and do some online research on the route. Though the snow on the west slope was rapidly turning to slop, the day was a success for the great weather and views and a good workout.